Dykstra Naval Architects has released more details on its design for the replica J Class yacht Yankee. Reviving a collaborative project announced in 2010 that has yet to be built, the replica J Class Yankee is designed the Dutch firm and would be built by Holland Jachtbouw (HJB). The Netherlands-based builder HJB has recently strengthened its partnership with J Class yachts and has the exclusive rights to build two new J Class designs, Yankee and J9, and is now ready to begin construction. As the J Class yachts make triumphant return to America's Cup with their own regatta in June 2017, this is the ideal time for J Class and racing enthusiasts to think about building or buying a J. The Dykstra design for Yankee is a replica of the original, which participated in a round robin series to win a Defending spot for the America's Cup in 1930. She was a contender to be Defender in 1930, but lost out for not being quite as fine-tuned as her rivals. 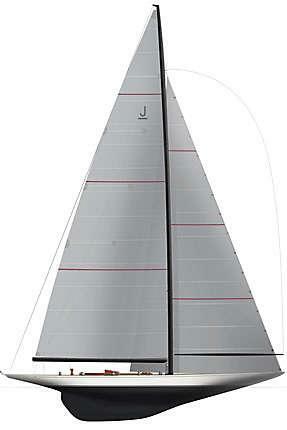 After modifications to her rig and bow, she proved more competitive and came back for the America's Cup 1934 trials. Sadly, the original J Class Yankee met her demise in 1941 as she was broken up as part of the war effort during World War II. Designed by Frank Paine, the original Yankee has a nearly straight sheer line and lines that are easy on the eyes. Dykstra's design retains this clean design with a flush deck layout, and performance is optimised as the yacht is designed to the new J Class Association rating system.